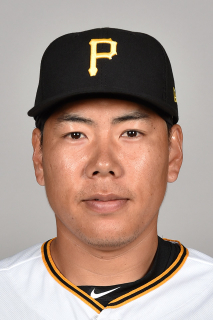 Jung Ho Kang (pronounced "GAHNG")...Is a 2006 graduate of Gwangju High School...Played third base for the Korean national team at the 2010 Asian Games...Trained at Pirate City in Bradenton, FL, in 2006 and 2007 while a member of the Hyundai Unicorns...Began his professional playing career at the age of 19...Played for Korea in the 2013 World Baseball Classic...Played for the Seoul Heroes from 2008-2014; the Heroes sold their naming rights to Woori Bank, and then after two years, Nexen Tire bought the naming rights...Woori Bank is headquartered in Seoul, South Korea, and the name Nexen is a combination of two future-oriented words; next and century. Began season on the MLB Restricted List... Reported to Pirate City on 5/1...Participated in Extended Spring Training action thru 5/31...Was assigned to High-A Bradenton on 6/1...Went 2-for-4 and hit a grand slam in his second game on 6/2...Homered again in his next game on 6/4 while collecting four hits and a stolen base...Hit his third home run in his fifth game on 6/6...Started at shortstop on 6/8 vs. Tampa and went 1-for-4 with a two-run double... Was transferred to Triple-A Indianapolis on 6/10...Was reinstated from the Restricted List and optioned to Indianapolis on 6/15...Went 3-for-4 with three RBI on 6/19 vs. Norfolk...Was scratched from the lineup on 6/20 due to left wrist discomfort...Was placed on the D.L. on 6/25 with a left wrist sprain on 6/25...Had surgery to debride cartilage in his left wrist on 8/3 in Pittsburgh (surgery performed by Dr. Ed Birdsong)...Was recalled by Pittsburgh on 9/28... Singled as a pinch hitter in his first at-bat with the Pirates on 9/28 at Cincinnati; his first Major League game since 10/2/16...Started at third base on 9/29 and went 1-for-4... Flied out as a pinch hitter on 9/30...Had option for 2019 declined on 10/31...Signed a one-year deal on 11/8. Established Major League career highs in home runs, RBI and OPS (.867)...Became the first Asian-born infielder to hit 20 or more homers in a Major League season; Shin-Soo Choo (Korea) & Hideki Matsui (Japan) accomplished the feat as outfielders...His 10 home runs hit between 8/13 and the end of the season were the third-most among all N.L. third basemen behind Nolan Arenado and Kris Bryant (11 each)...Ranked fourth among National League players with a 1.066 OPS and sixth with a .613 slugging percentage during the month of September...Began season on the 15-day disabled list recovering from left knee surgery from 9/17... Spent the first two weeks of the regular season in Extended Spring Training...Received medical clearance to participate in full game activies on 4/13...Began a rehab assignment with Triple-A Indianapolis on 4/18..,Was recalled from his rehab assignment and reinstated from the D.L. on 5/6...Made season debut with the Pirates on 5/6 at St. Louis and hit two home runs... Tied career high with four RBI on 7/27 vs. Seattle... Homered in back-to-back games on 8/13-14 and in three of his four game between 8/13-16...Injured his left shoulder while sliding headfirst into second base on 8/19...Was on the 15-day D.L. from 8/20 to 9/5; went 1-for-8 with a homer and three walks in three rehab games with Triple-A Indianapolis between 9/1-4...Was named N.L. Player-of-the-Week for the week of 9/5-11 after hitting .522 with four home runs, 10 RBI, a .593 OBP and a 1.680 OPS in seven games...Homered twice on 9/6 vs. St. Louis...Hit .307 (31-for-101) with 10 homers, 25 RBI and a 1.098 OPS in his final 31 big league games, dating back to 8/13...Had six home runs and 14 RBI in 15 games against St. Louis. Spent first season in MLB and finished third in the BBWAA voting for National League Rookie-of-the-Year...Ranked fourth in batting, fourth in OBP, fifth in RBI, fifth in runs, fifth in doubles and seventh in extra-base hits (41) among National League rookies...Was one of two rookie position players to make Pittsburgh's Opening Day roster (also Andrew Lambo)...Made 77 appearances (54 starts) at third base and 60 appearances (49) at shortstop...Set club rookie record for being hit by a pitch (17); previous mark was held by Jason Kendall (15 in 1996) and ranked third overall among N.L. leaders in that department...Made Major League debut on 4/8 at Cincinnati and grounded out as a pinch hitter...Made first big league start on 4/11 at Milwaukee (shortstop)...Made first career start at third base on 4/12 and singled off Kyle Lohse for first Major League hit...Tallied first three Major League RBI on a three-run double off Jason Motte on 4/21 vs. Chicago... His first Major League home run was a solo shot off Trevor Rosenthal on 5/3 at Busch Stadium (tied the score 1-1 in the ninth inning)...Had a putout and an assist while playing third base during a triple play on 5/9 vs. St. Louis... Connected off Trevor Lyons for first home run at PNC Park on 5/10 vs. St. Louis...Had a season-high 10-game hitting streak from 5/16-28 (15-for-41, .366)...Made 11 straight starts at third base from 7/5-19; Josh Harrison suffered a thumb injury on 7/5...Took over everyday starting shortstop duties on 7/20 after Jordy Mercer suffered left knee injury on 7/19...Reached base safely in 21 straight starts from 6/25 thru 7/25...Hit game-winning home run off Glen Perkins in the top of the ninth at Minnesota on 7/28...Homered in backto-back games on 7/28-29...Had three doubles on 7/31 at Cincinnati...Was named N.L. Rookie-of-the-Month in July after hitting .379 (33-for-87) with a .443 on-base percentage; ranked sixth among all N.L. batters in batting and sixth in OBP...The last Pittsburgh rookie to produce a higher average in a month (minimum of 75 AB) was Jason Kendall, who hit .413 (31-for-75) in August 1996...Was also tied for third among N.L. hitters with 13 extra-base hits during the month of July, the first Pittsburgh rookie to produce as high a batting average and as many extra-base hits in one month since Hall-ofFamer Paul Waner hit .381 with 14 extra-base hits in September 1926...Was hit by a pitch and homered in the same inning (seventh) on 8/9 vs. Los Angeles, the first Pittsburgh player to do that since Kevin Elster on 5/8/97...Made 34 consecutive starts (21 at short/13 at third) from 7/5 thru 8/15 before getting the day off on 8/16...Homered twice on 8/22 vs. San Francisco...Hit a 472' home run into the upper deck in Cincinnati on 9/8...Connected off Keyvius Sampson for first Major League grand slam on 9/9 at Cincinnati...Underwent season-ending surgery on his left knee on 9/17 after suffering the injury on a takeout slide at second base by Chicago's Chris Coghlan in the game that afternoon at PNC Park; had surgery to repair a fracture to the tibial plateau, an area near the knee at the top of one of two bones in the lower leg, and also to repair damage to the lateral meniscus. Led the Korean Baseball Organization (KBO) in slugging percentage and OPS (1.198) while playing for the Nexen Heroes in Seoul...His home run and RBI totals set single-season records for a shortstop...Ranked second in on-base percentage, home runs and total bases (309)...Also ranked third in doubles, third in RBI, fifth in runs scored and sixth in batting average...Established career highs in batting, runs, doubles, home runs and RBI...Was a teammate of league MVP Byung Ho Park, who hit .303 with 52 home runs and 124 RBI...Made all 113 defensive appearances at shortstop. November 8, 2018 Pittsburgh Pirates signed free agent 3B Jung Ho Kang. September 28, 2018 Pittsburgh Pirates recalled 3B Jung Ho Kang from Indianapolis Indians. September 28, 2018 3B Jung Ho Kang elected free agency. June 27, 2018 Indianapolis Indians placed 3B Jung Ho Kang on the 7-day disabled list retroactive to June 25, 2018. Left wrist sprain. June 15, 2018 Pittsburgh Pirates optioned 3B Jung Ho Kang to Indianapolis Indians. June 15, 2018 Pittsburgh Pirates reassigned 3B Jung Ho Kang to the minor leagues. October 13, 2017 3B Jung Ho Kang assigned to Aguilas Cibaenas. March 10, 2017 Pittsburgh Pirates placed 3B Jung Ho Kang on the restricted list. September 5, 2016 Pittsburgh Pirates activated 3B Jung Ho Kang from the 15-day disabled list. September 1, 2016 Pittsburgh Pirates sent 3B Jung Ho Kang on a rehab assignment to Indianapolis Indians. August 20, 2016 Pittsburgh Pirates placed 3B Jung Ho Kang on the 15-day disabled list. Left shoulder injury. May 6, 2016 Pittsburgh Pirates activated 3B Jung Ho Kang from the 15-day disabled list. April 18, 2016 Pittsburgh Pirates sent 3B Jung Ho Kang on a rehab assignment to Indianapolis Indians. November 6, 2015 Pittsburgh Pirates activated 3B Jung Ho Kang from the 60-day disabled list. September 21, 2015 Pittsburgh Pirates placed 3B Jung Ho Kang on the 60-day disabled list. Torn left lateral meniscus and fractured left tibia. January 16, 2015 Pittsburgh Pirates signed free agent 3B Jung Ho Kang.